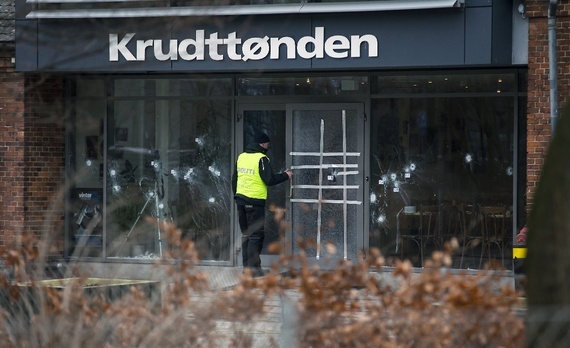 A gunman opened fire on a Copenhagen cafe that was hosting a discussion on art, free speech, and blasphemy on Saturday, killing one attendee and injuring three police officers. The apparent target of the attack, Swedish cartoonist Lars Vilks, was uninjured. The same gunman later killed a Jewish security guard outside a synagogue before being killed himself in a confrontation with police. Vilks became a target of extremists in 2007 after producing a series of sketches which depicted the Prophet Mohammed with a dog’s body. Since that time several people have been arrested for plotting to kill Vilks, he was physically assaulted during a lecture at a Swedish university, and he was included on the most-wanted list of al-Qaeda in the Arabian Peninsula, the same group that trained the brothers who attacked Charlie Hebdo in Paris last month. Like that paper’s editor and cartoonist Charb was before his death, Vilks is accompanied by bodyguards whenever he appears in public. They quickly hustled him into the cafe’s kitchen when the attack began. France’s ambassador to Denmark François Zimeray was also attending the event and was kept safe in a cold storage room during the shooting. The suspect in the cafe and synagogue shootings was Omar El-Hussein, a 22-year-old Danish man of Palestinian descent. Unlike the Kouachi brothers in Paris, he had not traveled abroad for training, but he had been released from prison just a few weeks ago after a two-year sentence for stabbing a man. In Denmark as in France, there is widespread concern that prisons may be fertile breeding grounds for radical extremists. El-Hussein was killed by police on Sunday as he arrived at an address that had been placed under surveillance in northwest Copenhagen. Authorities are still investigating whether El-Hussein may have been part of a larger plot, but as of Sunday they had only arrested two men who allegedly aided him after the fact.